A hospital asked people not to visit its emergency department while it was struck by a power cut for several hours. The Queen Elizabeth The Queen Mother Hospital, in Margate, Kent, lost power at about 19:30 GMT. It said patients were moved to other departments and fire crews assisted with emergency lighting before power was restored shortly before 23:00. Ambulances were also diverted to the William Harvey Hospital in Ashford. 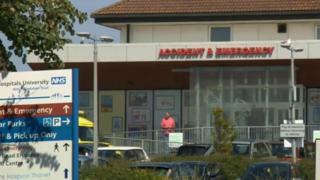 In a statement, East Kent Hospitals University NHS Foundation Trust said the hospital was "now operating as normal". Earlier, the hospital asked people not to attended its emergency department, which was in the area affected by the power cut. A spokesperson had said "contingency plans" were in place "to keep patients safe until power is restored". Kent Fire and Rescue Service said it sent four fire engines to "assist with emergency lighting".